This internationally successful group from Birmingham contributed their incredible vocal harmonies to some of the most melodic and enduring pop songs recorded during the 1960s and 70s. Discovered by pioneering pop music promoter Reg Calvert, The Fortunes were also to showcase the talents of hit songwriting team Roger Greenaway and Roger Cook. The Fortunes story begins in 1960 when Moseley Grammar School pupils Rodney Bainbridge (born 31 March 1944) and Barry Pritchard (born 3 April 1944) formed a singing duo known at the time as "The Strollers". They were later joined by drummer Leigh Clark and bass guitarist Mick Tomlinson with whom they performed a number of times at The Shirley Institute and the Co-op Hall in Nuneaton. It was early in 1963 when The Strollers were spotted by innovative pop music promoter and "pirate radio" pioneer Reg Calvert who saw potential in Rodney and Barry. Reg invited them to live on his estate at Clifton Hall near Rugby. Clifton Hall was to become something of a school for would-be pop stars in the early 1960s with Reg Calvert discoveries such as "Johnny Washington", "Danny Storm", "Buddy Britten" and "Robbie Hood" already being groomed for stardom by the time Rodney Bainbridge (now Rod Allen) and Barry Pritchard arrived there. It was Reg's idea that London vocalist Robbie Hood (Mike West) should have his own band of "Merry Men" so Rod and Barry were drafted to provide the appropriate vocal and instrumental backing with Rod Allen now playing an electric bass guitar and Barry with a new Burns electric six-string. Like it or not, they were also kitted out in uniforms of lincoln green that included jerkins, boots, and yes - tights! (another Brum group The Sundowners would also later do time as Robbie Hood's Merry Men). Fortunately, it wasn't too long before Reg Calvert realized Rod and Barry (much to their relief!) would be better suited to forming their own group and so paired them with another of his 'discoveries' in the form of aspiring vocalist/guitarist Glen Dale from Kent (born Richard Garforth on 24 April 1943). The trio soon found their main strength lay in the three-part harmonies which they expertly developed to form the trademark sound that would make them famous. "Reg held competitions and, if people shouted a number that we couldn't do, he would pay them half-a-crown"
Launched by Reg Calvert as "The Cliftones" (in reference to Clifton Hall), the trio proved to be a successful live act. Barry Pritchard recalled; "Reg held competitions and, if people shouted a number that we couldn't do, he would pay them half-a-crown. It was no big deal. There might be twenty people shouting out, so Reg would only pick out numbers that we knew!". Around this time, drummer Andy Brown (born July 7, 1946 and previously with a local band called The Lawmen) along with keyboard player David Carr (born 4 August 1943, Essex) were added to the line-up. Re-named "The Fortunes Rhythm Group", the 5-piece band won first place at a beat contest held at Edgbaston's 'Tower Ballroom'. The group projected a clean, well dressed image on stage and encouraged by manager Reg Calvert, included covers of Dionne Warwick, Gene Pitney and Broadway show songs into their repertoire. Note: there were a few other bands called "The Fortunes" active in the West Midlands area during the early 1960s including a different unrelated line-up who recorded a track for the DIAL "Brum Beat" LP in 1964. Reg Calvert managed to get The Fortunes signed to the prestigious Decca Records label in late 1963. Their first record release - under supervision of future Who and Kinks producer Shel Talmy - was a bizzare cover of The Jamies 1958 U.S. hit 'Summertime, Summertime'. This single was also attributed to "The Cliftones". The B-side 'I Love Her Still' was composed by Barry Pritchard. A second Fortunes single 'Caroline' released the following year was adopted by the pirate radio station "Caroline" as its theme tune. 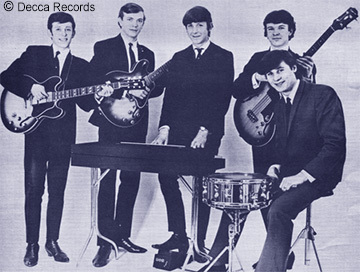 Despite plenty of airplay, the record did not chart and their next single A-side titled 'I Like The Look Of You', although highly competent, was derivative of the current popular "Mersey Sound". It was probably no coincidence that The Fortunes became one of the bands featured on Decca's 1964 "Live At The Cavern" LP recorded at that legendary venue in Liverpool. Compositions by group members in those days were usually confined to single B-sides. These included Barry Pritchard's 'Come On Girl' which appeared on the back of The Fortunes third single, and the group composition 'I'll Have My Tears To Remind Me' from their fourth release in 1964. For the band's next single, Decca tried a different approach. Shel Talmy with assistance from Mike Leander (who was also working with Brum hit group The Applejacks) had The Fortunes cover Johnny Ray's 1957 hit ballad 'Look Homeward Angel' that featured Rod, Glen, and Barry's wonderful harmony vocals over a heavily orchestrated backdrop. The result was an incredible recording that clearly showed the group's potential but unfortunately it also failed to make the charts. "I wanted to use them as singers backed by professional musicians"
Now with four strikes against them, Decca reluctantly gave the band one last chance. 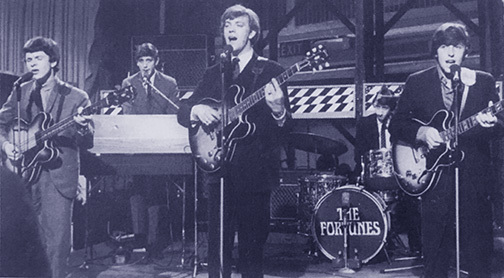 The Fortunes fifth single was a new composition written by then-unknown songwriters Roger Greenaway and Roger Cook. The recording featured lavish instrumentation arranged by Les Reed as well as the now trademark three-part harmonies by the group featuring Rod Allen's lead. Produced by Noel Walker at Decca he recalled; "The Fortunes contract came up for renewal and Decca didn't want to renew it. I told Decca that they sung wonderfully and deserved another chance. I wanted to use them as singers backed by professional musicians". The song titled 'You've Got Your Troubles', suited the band's sound and image perfectly. This record almost reached the top spot in the British charts in August of 1965 and also climbed to a respectable Number 7 in the U.S. charts. The record made it to Number One in Canada and New Zealand. The composers Greenaway and Cook were initially dismayed to discover that an "unknown" group had recorded their composition but were happy with the record's success and still regard the Fortune's version to be the definitive one. The single's B-side titled 'I've Got To Go' was also very good and featured a lead vocal from Glen Dale. With a hit formula now established, a follow-up, the prophetically titled 'Here It Comes Again' was soon recorded by The Fortunes and released in October as their next 45, gaining a Number 4 chart placing in the UK. Rod Allen said; "After 'Troubles' Les Reed and Barry Mason wrote Here It Comes Again especially for us. It even had the chat line in the middle. We couldn't have wished for a better song and it was a top five smash." Following this success, The Fortunes joined the famous "British Invasion" and went on a package tour of the U.S.A. along with 'Peter & Gordon' and fellow Brum group The Moody Blues who were at that time enjoying the international success of their hit single 'Go Now'. The Fortunes self-titled first album was issued in 1965 in both the UK and USA. Roger Greenaway and Roger Cook would also have their own chart success the following year as the singing duo "David and Jonathan" with a cover of The Beatles 'Michelle' and their own 'Lovers Of The World Unite'. In early 1966, the Fortunes 7th single 'This Golden Ring' was to reach Number 15 in the charts but that year also saw a minor scandal erupt when the group admitted during an interview that session musicians were responsible for the instrumentation on their hit records excepting the vocals. Although this was not an uncommon practice back then or today, it may have damaged the groups' credibility among some of the more "serious" music fans at the time. A further more tragic blow occurred on June 21, 1966 when The Fortunes manager Reg Calvert who also owned "Radio City", a pirate radio station located in the Thames Estuary, was shot to death by former politician and war hero Oliver Smedley at his house during a dispute over a business deal. In the resulting trial, Smedley who represented a rival pirate station "Radio Atlanta", entered a plea of 'self-defense' and was found 'not guilty' but the incident and verdict remains controversial to this day. 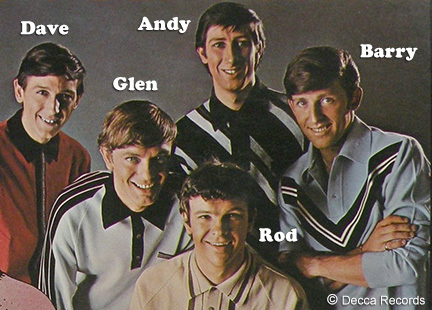 The Fortunes next few singles had missed the charts despite their commercial appeal and in July 1966, guitarist/vocalist Glen Dale left the group to go solo following a disagreement during their recording session for 'Silent Street'. With Rod Allen usually selected to sing the lead on their single A-sides, Glen said; "I just felt I was being squeezed out." His only record release on Decca was a cover of The Beatles 'Good Day Sunshine' after which he seemed to disappear completely. Glen's place in the group was taken temporarily by Peter Lee Stirling of The Brusiers who recalled; "I'd known Reg Calvert for years as he used to book us when we were the original Beachcombers. The Fortunes were mates from the early days back in Birmingham. I remember doing a few dates down on the south coast and then a couple of shows in Ireland and Scotland with them." While performing at East Kilbride in Scotland, The Fortunes discovered talented Scottish vocalist/guitarist Shel MacRae from a group called "The Kimbos". Shel joined the Fortunes officially but with the onset of the psychedelic era, the Fortunes' record sales continued to decline. Like fellow Brum pop group The Rockin' Berries before them, The Fortunes soon discovered that plenty of bookings were available on the lucrative "cabaret circuit". "We were like wet fish on a slab, and it took us some years to get back"
In August of 1967, the Fortunes switched to the United Artists record label and released new singles consisting of self-composed material. The first of these was the excellent track titled 'The Idol' composed by Rod Allen and Barry Pritchard. This change of direction, although promising, did not achieve chart results but the group soon found new success in recording 'advertising jingles', most notably 'It's The Real Thing' for Coca-Cola. This, along with regular bookings on the northern club circuit, sustained the band throughout the later 1960s. Barry Pritchard said; "We were like wet fish on a slab, and it took us some years to get back." Another interesting recording by The Fortunes during this period, was their version of 'Fire Brigade', a song written by Roy Wood of The Move who were also from Birmingham. Although the single was a major hit in Britain for the Move in 1968, the Fortune's version, which may have also included a backing vocal by Roy Wood, was only issued in the U.S.A. where it made no impact on the record charts. David Carr left the group in August 1968 to go and live in America and work in music production. He was replaced a few years later by George McAllister but it seemed to many that The Fortunes career as a recording group was behind them. One of The Fortunes more promising releases at the end of 1968 was their version of 'Seasons In The Sun' composed by Belgian singer Jacques Brel. Strangely, the record was not a hit for The Fortunes but became a world wide best seller in 1974 when recorded by Canadian singer Terry Jacks. Ironically however, The Fortunes started to have some success in the USA with the release of a new album and their version of songwriter Tony Macaulay's 'That Same Old Feeling' receiving airplay there and entering the American and Canadian charts. This song became a big hit for the British pop act "Pickettywitch" with their recording of it charting in the UK at around the same time. A switch to the Capitol Records label in 1971, saw The Fortunes hooked up once again to hit song writers/producers Greenaway and Cook and the result of this renewed partnership was a great new single titled 'Here Comes That Rainy Day Feeling Again' which gained the Fortunes a Number 15 chart placing in the USA and also a hit in Canada. The comeback was complete when The Fortunes next single, the Caribbean-flavored 'Freedom Come, Freedom Go' climbed all the way to Number 6 in the British charts in September 1971 and stayed for a total of 17 weeks - their longest ever UK chart showing. This was followed a year later by their brilliant rendition of 'Storm In A Teacup' (written by singer Lynsey de Paul) also making it into the top ten. Despite surprisingly having no further chart success in the UK and personnel changes over the next few decades, The Fortunes remained very popular as a major attraction on the club circuit and in 1960s nostalgia shows as well as tours to Europe and overseas. Rockin' Berries vocalist Geoff Turton also joined The Fortunes for a while and like some of their contemporaries (for better or worse), the band introduced comedy routines into their shows. The Fortunes original drummer Andy Brown left the group in 1977 and went to work as a postman in Worcester. He can still be found playing drums occasionally in various local bands to this day. 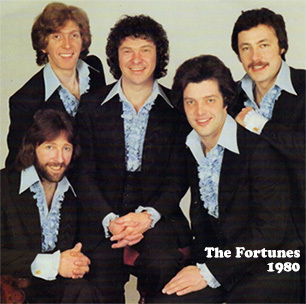 By 1980, the Fortunes line-up (as shown in this photo) had from left to right; Barry Pritchard, John Trickett (drums), Rod Allen, John Davey (vocal, impressionist), and Rick Persell (guitar,vocal). The group was at this time managed by John Francis. Barry's brother Dave Pritchard from the Birmingham cabaret group Sight and Sound (and no relation to Dave Pritchard from The Idle Race) was part of The Fortunes line-up but had to leave in 1983 due to ill health. He was replaced by Midlands guitarist/vocalist Michael Smitham who had played in several professional working bands. Fortunes founding member vocalist and lead guitarist Barry Pritchard left the group in 1995 due to ill health and went to live in Spain at Costa del Sol where he operated his own restaurant and bar. He died from a heart attack in January 1999 at only 54 years of age. The Fortunes original keyboard player David Carr passed away in 2011 at age 67 after years of living in America where he performed and toured in the legendary instrumental band "The Ventures". He also worked there as a record producer and played on many sessions - notably for 70's hit pop singer Helen Reddy and Kim Fowley's all-girl band "The Runaways". 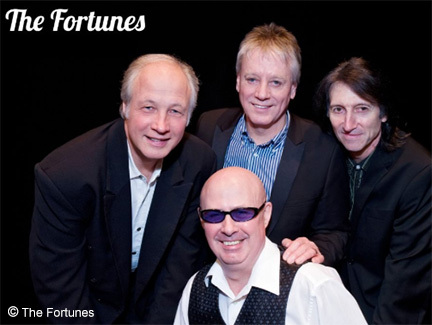 The only remaining original Fortunes member Rod Allen continued to tour and record with the present line-up of the band which also included veteran musicians Michael Smitham (guitar/vocals), former "Badfinger" keyboard player & vocalist Bob Jackson, and Paul Hooper (drums). Despite having previous good health in fronting The Fortunes over five decades, Rod Allen passed away suddenly from cancer in January of 2008 at age 63 leaving the group's future at that time uncertain (see BrumBeat feature on Rod Allen). It was Rod Allen's wish that The Fortunes continue to perform after his death so a worthy replacement was selected when "The Dakotas" vocalist/bassist Eddie Mooney from Stoke-On-Trent joined the band. Paul Hooper left the line-up in 2010 with former "Marmalade" drummer Glen Taylor selected as his replacement. Now, with long-time member Michael Smitham at the helm, The Fortunes continue their tradition of high-quality performances throughout the U.K. and the rest of the world. The last surviving Fortunes founding member Glen Dale went on to record some singles for various labels and played the UK club circuit during the 1970s. He later moved to Tenerife in the Canary Islands and performed there for many years as a singer at some of the resorts before eventually retiring to Eckington near Sheffield. Despite ill health, Glen recently went to a Fortunes concert performance and was invited up to sing a few of their early hits with them which he happily did from his wheelchair. His voice that night was still exceptional. Glen Dale passed away on January 13, 2019 aged 79. Sources: 'The Guinness Book of British Hit Singles' 5th edition 1985; 'Where Did You Go My Lovely' book by Fred Dellar 1983; 'Brum Rocked!' and 'Brum Rocked On!' books by Laurie Hornsby 2003; 'The British Invasion' book by Bill Harry 2004.